Comedian and Actor Harland Williams is known the world over for his hilarious movie roles and outlandish stand up and sketch comedy routines. From his unforgettable roles in films such as “Dumb and Dumber,” “Something about Mary,” “Half Baked,” “Rocketman,” and so many more. Add to this his incredible stand up comedy routines, which have been seen on “Letterman,” “The Tonight Show,” “Conan,” HBO, Comedy Central and everywhere else! 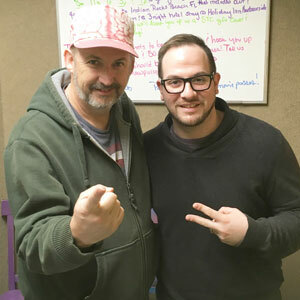 Listen as Harland Williams talks with Frankie about his ancestors, who his favorite actor is and how his dog got taken away by an owl! Catch Harland Williams at Goodnight’s Comedy Friday, Feb 10, 2017 – Feb 12, 2017. Visit Goodnightscomedy.com for tickets or more information.